McKesson of Texas hosted The Build-a-Bike program, a team building event for 50 of their employees in their warehouse in Carrollton. McKesson has a long history in health care and a trusted provider of medical supplies and goods for more than 175 years is driven by a Shared Principles, known as ICARE. 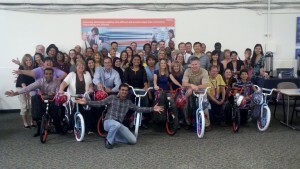 These principles unite all employees at McKesson and it shows, In addition to the Build-a-Bike event, the VP-Kala Patel and R.T. Hall and the folks at McKesson also purchased 8 back packs to hang from the handle bars of the new bikes for the eager recipients. The team building activities brought out the playful banter amongst the group, and when one team figured out a clue they scurried around to the other teams to share their findings. McKesson exhibits team work and that communication is vital within an organization, without it the consequences could be disastrous. The Boys & Girls Club of Greater Dallas was the organization that we worked with in order to provide children in need with a new bike. When the children entered the room you could hear and see the sniffles in some of these folks as they watched the kids get their bikes and back packs. This warehouse was the perfect space for kids to try out the new bikes, one little girl didn’t know how to ride a bike and got a quick lesson from one of the men who built her bike.